Optimiza, Jordan’s leading regional Systems Integrator, announced today that it is the first Jordanian company to obtain CMMI accreditation. CMMI® “Capability Maturity Model Integration” is currently considered the most widely accepted and adopted process improvement approach worldwide. It is known to provide organizations with the latest best practices for product and service development and maintenance, to improve quality and surpass the competition. This achievement comes after a yearlong preparation that included training, implementation and continuous development of work procedures. The project was facilitated through the national program that was launched by the Information Technology Association of Jordan – int@j with support from the USAID Jordan Economic Development Program – SABEQ in cooperation with the QAI international company. The program started in the last quarter of 2009 aiming to evaluate and improve the quality and performance of Jordanian companies using the approved best practices in the fields of development, software implementation and project management according to CMMI® Level -3 for Development. Applying the CMMI® model forces companies to commit to a number of instrumental procedures and assessments. Getting the CMMI® accreditation is of a great advantage for both the clients and the employees of an organization. It improves the quality of the products and services as well as improving the productivity of the companies by enhancing work procedures. It also promotes and reinforces the company’s capabilities to predict projects schedule and achieve higher return on investment and enhance the capability to manage risks. 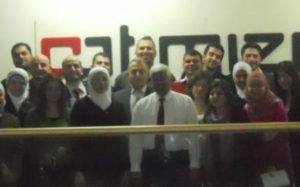 Today Optimiza adds a new achievement to the Jordanian record of excellence.